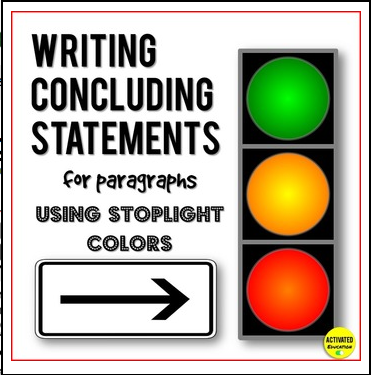 This is a short lesson on writing concluding sentences using color-coded writing strategies compatible with Step Up to Writing. I used this in my intervention class of 7th grade students who were not including conclusions in their paragraphs, but it works well as a lesson introducing the skill and can be used in small group or with a whole class. The lesson includes guided practice and independent practice based on high interest topics (popular song and movie). An optional printable student response sheet is included, to be used as a formative assessment either as an exit ticket or entrance task following the lesson.